Nynas polymer modified binders, under the collective name Nypol, is made ​from specially selected bitumen, mainly in combination with SBS polymers. Nynas polymer bitumen complies with EN 14023 and Nynas specifications. On average nearly 180,000 vehicles use the Essingeleden motorway every day, making it one of Sweden’s busiest roads. The motorway links the cities of Solna and Stockholm, and also handles high levels of traffic flows between the north and south of the capital, so effective maintenance is a priority. This is a major challenge, due not only to the level of traffic, but also the climate and the nature of the road. The lanes on the motorway are relatively narrow at between 2.9–3.5 metres, often leading to high pressures on the same stretch of road. The motorway requires regular inspections and its rutting level cannot go beyond 16 mm below the maintenance standard in any of its 4 lanes. Levels of wear from studded tyres are highest in the 2 middle lanes of the motorway, at between 3–4 mm per year, going down to between 1–2 mm in the outer lanes. This has historically meant that the motorway has needed resurfacing at least every four years to provide a homogenous surface and keep traffic moving. 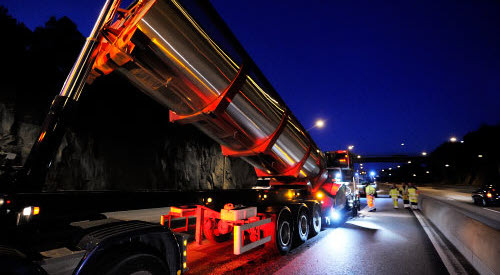 Svevia, an independent road operator, resurfaced some 15 stretches of the Essingeleden motorway in the summer of 2013, covering an area of 33,000 m2 . The Transport Administration chose to use asphalt with polymer modified bitumen to combat attrition and pressure traces. Contractor Svevia selected Nynas’ extra performance product Nypol 67. “The goal was to achieve a longer lifespan on the wearing course using a PMB and to reduce rutting,” explains Niclas Krona, Head of Sales South/West Sweden, Nynas. Anna Wireman of the Swedish Transport Authority notes that a PMB was the best option for the project. “It is worth using a PMB on this road, even though it is a bit more expensive. Our hope is that use of PMB 45/80-55 will help us to reduce rutting and decrease wear from studded tyres.” So far the results have been positive, and the authorities are hopeful that their investment in PMB will pay off in the form of increased road durability.